Originally published under the title "D.C. Refuses to Arm Persecuted Christians Fighting ISIS." Dwekh Nawsha, an Iraqi Christian militia force based in Ninevah province, has been fighting Islamic State for over a year. In recent months, Mideast Christians have been forming militias to fight the Islamic State (IS) and other jihadi groups in both Iraq and Syria—even as the Obama administration, which arms the "opposition," refuses to arm them. In Iraq, some of the few remaining Assyrian Christians have formed militias under the name Dwekh Nawsha (literally meaning "self-sacrifice" in Christ's native tongue of Aramaic). Most of these fighters are from among those Christians displaced from the Ninevah Plain due to the atrocities committed by IS and are on the front lines fighting the jihadis. Dwekh Nawsha was formed soon after the U.S.-supported Kurdish Peshmerga, which is leading the fight against IS in the region, retreated from many Christian villages without a struggle last summer, declining to protect them from the IS advance which led to the usual atrocities. U.S.-backed Kurdish Peshmerga abandoned Iraqi Christian villages without a struggle last summer. According to the Christian Science Monitor, "Christians have taken up arms because they want to protect their own land, and many no longer trust the Kurds to do it for them." Indeed, the Kurds, including the Peshmerga, have been known to abuse and even persecute Christians. Like IS, Kurds are Sunni Muslims too. "We will stay here, and Christians will protect Christians. Not Arabs or Kurds protecting us, but Christians," said local commander Fouad Masaoud Gorgees. In neighboring Syria, approximately 500 Syriac Christian fighters recently assembled and managed to prevent the Islamic State from entering the ancient Christian settlement of Sadad. But on October 30, IS captured a town less than five miles away, leaving Sadad vulnerable to continued assaults. It was emotional but it was also very encouraging to see our young people determined to defend their land and stay in their homeland. To see them ready to fight and to sacrifice for their land, I think that's what's very meaningful, that made me very proud of them. There's a reason why Christians are frantically trying to save Sadad from the clutches of IS. As one Syriac Christian fighter put it, Sadad "is a symbolic place for us and we will not allow it to fall again." 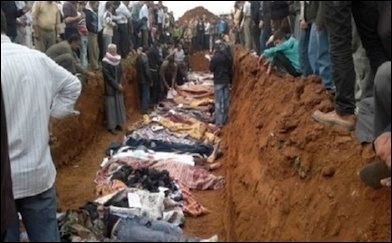 Christians massacred by the Free Syrian Army in Sadad in October 2013. He is referring to the events of October 2013, when the U.S.-supported Free Syrian Army—widely touted as moderate but in fact working with al-Qaeda's Al Nusra Front—captured the town. They made a graphic video (with English subtitles) of those whom they killed, the "dogs of Assad"—"dog" being an ancient Islamic epithet for Christians—while shouting Islam's victory-cry, "Allahu Akbar" (which John McCain equates to a Christian saying "thank God") and praise for the Free Syrian Army. During their one week occupation of Sadad, the moderate/radical coalition tortured, raped, and murdered 45 Christians; the bodies of six people from one family alone, ranging from ages 16 to 90, were found at the bottom of a well (an increasingly common fate for "subhuman" Christians). At the time, Syriac Archbishop Selwanos Boutros called it Syria's "largest massacre of Christians." Even so, this massacre was wholly ignored by the Obama administration and so-called mainstream media in an effort to maintain the narrative that the Free Syrian Army was "moderate." We have shouted aid to the world but no one has listened to us. Where is the Christian conscience? Where is human consciousness? Where are my brothers? As persecuted Mideast Christians have well learned since, most Western governments—the Obama administration at their head—could care less about their fate. They care only about one thing: overthrowing Assad—at any cost, including by directly or indirectly arming the Islamic terrorists that persecute Christians in horrific ways, including slaughtering those who refuse to renounce Christ for Muhammad. 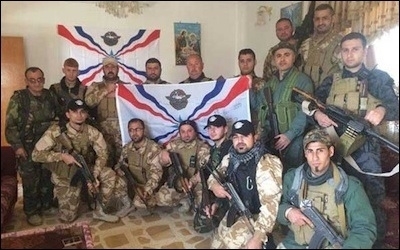 Yet truly "moderate" Christian militias fighting the Islamic State are denied arms from Washington: "Lobbyists in D.C. are blocking weapons and equipment from reaching Dwekh Nawsha, the Christian militia force that has been fighting ISIS in Iraq's Assyrian Nineveh plains." 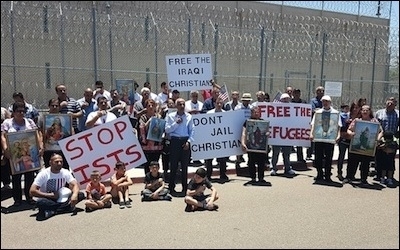 Rather than welcoming Iraqi Christian asylum-seekers, the United States has imprisoned many of them. Retired Lt. Col. Sargis Sangari, an Iraq war veteran who served 20 years in the army, says: "As much as you're giving money to all these individuals who are killing each other [the "moderate" terrorists, Kurds, etc. ], why don't you try to give it to the Assyrians?".... Currently, their [Christians'] lack of resources prevents them from launching an offensive." U.S. funding, training, and equipment would allow these Christian militias to take the fight to IS, added Sangari. Of course, all of this assumes that U.S. leadership actually wants the Islamic State and other "moderate" jihadis to be defeated in an offensive by anyone—a dubious assumption. Still, persecuted Christian pleas have not totally fallen on deaf ears. A few Western Christians, mostly Americans, have traveled to the Middle East to help the indigenous Christians fight the jihadis. Seeing their governments, which possess the military capability to annihilate the Islamic State, do next to nothing—not even help arm Christians—against IS, these Western Christians have decided to take it on themselves to fight the good fight on behalf of the weak and oppressed. Brett Felton, a former American soldier who once served in Iraq, now sees himself as a "soldier of Christ" and has returned to help train Dwekh Nawsha against IS. According to the 28-year-old, "One man's terrorist is another man's freedom fighter. But here we're actually fighting for the freedom of the people ... to be able to live without persecution, to keep the church bells ringing." U.S. vet Jordan Matson, who has the words "Christ is Lord" inscribed in his vest, said: "I decided that if our government wasn't going to do anything about it, I would... We're getting shot at [by IS/jihadis] on pretty much a daily basis.... We don't have the technology that the United States military has to push our enemies away." First the Christians of Iraq and then Syria implored the West for help against the Islamic persecutors that the United States unleashed by overthrowing secular strongman Saddam Hussein and now against Bashar Assad. Brutally persecuted Christians were totally ignored by both government and media—even as Obama and media now try to pull on the heartstrings of Americans to accept tens and hundreds of thousands of Muslims. Then Christians implored the Obama administration to simply stop arming their persecutors. When that too fell on deaf ears, vastly outnumbered and underequipped Christians gathered to fight the Islamic State head on, hoping the U.S., which showers the "opposition" with weapons, would help equip them against IS. No such luck. As a result, a few Western Christians who believe in religious freedom are risking their personal lives to help their Mideast brothers against the scourge of "ISIS." In light of all this, to still fail to understand which "side" U.S. leadership is on—they currently claim to be on the side of "democracy," "freedom," and "human rights"—is to be beyond naïve.